Ive interested in drawing a gaphic novle of Peter Pan. But, the copyright laws in the Uk are a little confusing. Pretty much anywhere else in the world its in the public domain, BUT, in England Great Ormond Street hopsital has certain rights. "Does Great Ormond Street Hospital have the copyright in Peter Pan in perpetuity? No, the hospital has a right to royalty in perpetuity in the UK, but this is not a true copyright. This right was granted to the hospital by the Copyright Designs & Patents Act (1988) and applies to stage productions, broadcasting and publication of the whole or any substantial part of the work or an adaptation of it in the UK." What does this mean exaclty?Would I be free to do an adaption but havta pay royalties if I sell it? Thus would I have to contanct them first?Can they refuse me outright? The legal basis for this unique arrangement is Section 301 of the Copyright Designs and Patents Act 1988, which is expanded upon in Schedule 6. As can be seen from these two references, the Great Ormond Street Hospital for Sick Children (GOSH) is entitled to a royalty from any production of the play PeterPan or any adaptation based on the play. So this would include your idea for a graphic novel. This leads to many follow up questions, such as how much is the royalty, when would a story which featured a character called Peter Pan not be an adaptation of the play and so on. The answer to the first question is that a royalty would need to be negotiated with GOSH, and if no agreement could be reached, the matter would need to be referred to the Copyright Tribunal. I am not aware of any previous decisions by the Copyright Tribunal on this issue. As for what would constitute an adaptation, ultimately this would have to be for the court decide, just as in any other case where an adaptation was is dispute. Again, I am not aware of any court cases on this. I imagine that since the GOSH trust fund is a charity, they would not wish to spend large sums of money on litigation. And no, GOSH could not prevent you from creating your adaptation of the story, but obviously they have the right to enforce their entitlement to a royalty. You would own the copyright in your version of the story. Incidentally, there have been a surprising number of works based on the original story, many of which, of course, will not be subject to the UK law. Okay, I think that clears things up a little. There are some other books Im interrested in adapting too, if you could offer some help? As far as Im aware there all in the public domain. But im concerned about using certain elements. Lets take "Pinocchio" for example. In the books its a sea monster or shark, some kinda big fish, but not a whale. They changed that in Disney however. Ive seen other adaptions use a whale, including animation (Pinocchio in Outer Space), cartoons, easy to read books for children. I know you cant copyright ideas so I would THINK, using a whale instead would count. So long as its not the exact ssame character, wouldent that be alright? As long as it doeset look like an exact copy or have the same name?? Would this be permitted?A homage?Or perhaps a transformative use? I wouldent be drawing the story exactly the same either, like word for word scene for scene of any other adaptions. For that matter the story isnet there own entire creation to begin with. They take inspiration from other sources themsleves for that matter. Example: The E.D. Baker novel The Frog Princess (2002), based on the frog prince, gives a twist to the traditional tale by transforming the heroine into a frog when she kisses the frog prince - the Walt Disney Pictures animated film The Princess and the Frog (2009) is inspired by this version of the story. When starting to consider the protection of individual characters or story plots etc you soon find that US and UK law have a number of differences. However without going into too much detail, in essence both systems look to see whether a substantial part (this exact term is only found in the UK legislation) of the original has been copied. 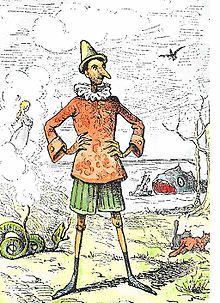 So if you wanted to write a Pinocchio story based on the characters which appeared in Carlo Collodi's original book, there would be no problem because that work is out of copyright, but new elements to the story which were added by Walt Disney for the 1940 film would be a different matter. Indeed one film maker was sued by Disney but won exactly because they argued that their film was based on the original Italian story. However if you look at the poster for the film shown on the Wikipedia article, it is clear that their Pinocchio looked a lot more like the Disney character than the illustration which accompanied Collodi's book. What counts as 'substantial' tends to be measured in terms of the quality of the element which is alleged to have been copied rather than the quantity, so minor characters or story details are likely to be a lot less contentious than would be the case with main characters or the main story line. Under UK law, if a substantial part of the original copyright work is found to have been copied, it doesn't matter to what extent it was transformed in the copy, infringement could well be proved. But beware that at times the court may take a quantitative approach, as in the Harry Potter Lexicon case, where it was the sheer quantity of small references, when added together, which helped to persuade the court to find in JK Rowling's favour, although the case was by no means a conventional copyright one. Popular authors such as JK Rowling, and Dan Brown, to name but two, have been involved in several court cases over just these sorts of issue. For that reason it is better to avoid basing anything on in-copyright works of famous living authors, firstly because they and their publishers will have the funds to resort to litigation, and they have more to lose if their 'brand' is diminished by works which cash in on the popularity of the original. So by all means be inspired by the works of others, but as with your idea for song lyrics, make it nearly impossible for outsiders to see from where you have actually drawn your inspiration. Best be careful I spose. If I wanted to draw a frankenstiens monster, is there anything I should avoid? I heard its okay if it doesnet feature all of these traits. Frankenstein Copyright - Please note although you may use the term "Frankenstein" and "Monster of Frankenstein," Universal Studios holds the copyright to the signature Frankenstein image which is characterized by ALL 5 of these elements: 1. Green Skin 2. Flat Top Head 3. Scar on Forehead 4. Bolts on the Neck 5. Protruding Forehead. If you'd like to resubmit this image you will need to edit your character to deviate from ANY 1 of these 5 specifications. So I guess you could have a green frankenstien, a diffrent scar or no scar, and no flatop or bolts. It is worth saying two things to start with. First it really doesn't matter what Universal (or any other rights owner) claims are the key elements, as that would be for a court to decide. And secondly there are differences in the way that the US and UK law determines how these things are assessed. For instance, you referred in an earlier post to the concept of 'transformative' use which has been developed under the US fair use doctrine, but there is no corresponding defence in UK (or EU) law, so really we are faced with an apples vs pears situation. To take another example, the newly created exception in UK law for parody might well allow you to use all of the elements listed by Universal without infringing, so long as your purpose was clearly for parody. I think a better approach is to ask yourself why you want to copy someone else's work in the first place. If you want to poke fun or criticise or carry out an academic analysis of the subject matter, the UK law permits most of these things within the fair dealing exceptions. But if you are only motivated by piggy-backing on the popularity or economic success of someone's else's creativity, then you are far more likely to run into trouble. Even if you don't fall foul of copyright law, there is also trade mark use and the tort of passing off, not to mention the ethical problem of plagiarism, which could all apply in certain circumstances. From what you have told us so far, I cannot see what you motivation is, and so it's hard to advise you. Ah I see. I guess that makes sense, I mean it seems in some cases just sue forthe sake of it, even famous companys with no real right. Well with things like Peter pan and Pinocchio, Im kinda interseted in retelling them becuase I have a love for classic childrens lit. And using my own artistic style to do so. In the case of frankenstien, I wanted to do a graphic novel story about a town where monsters live like regular people. A bit of a cliche perhaps but I wanted to try my own hand at it and put my own original twists and ideas in a story. Vampires, werewolves, etc. But with more famous monsters like frankenstien it seems to be a bit of a minefield. I dunno if it would count as a parody as its not a retelling of the actual story, but it is using a charcter in an alternate role and setting. I would think thats transformative, but, I dont really understand the in and outs of the law. I'd like to perhaps do a similair kind of story with fairy tale characters. Reckon those are safer cuz almost all fairy tales have no real owner and like Hans Christian anderson tales, are in the public domain. This would also be more original and fun I think than simply retelling the stories. And the law is just so hard to undertand. Im hoping to go pro really but I dont understand all the ins and out of things like art and writing. But mayby such an area is a risk in itself?Ive heard of people getting sued all the time but there accusers have no leg to stand on or any legit claim. Its kinda like the boy crying wolf. And I think perhaps Im just panicking and overthinking a little. Bit I figured it couldent hurt to ask. It sounds like you have plenty of good ideas, which are based largely on your own creativity and the use of, say, monsters, is just a vehicle for your idea. On that basis I don't think you should be too held back by worrying about infringement claims. For example, taking your town populated with monsters, I don't think you need to rely on copying specific monsters for the idea to work. Just a couple of features from any of the dozens of film characters of the past seventy years should easily suffice to make your point, without, for instance deliberately copying the five features Universal identified. Arguably the two American TV series The Munsters and the Addams Family did something similar to your idea. And if your monster town story had a humorous side, then it sounds as if the parody exception could well apply. Equally if your Pinocchio story poked fun at something (say Pinocchio became a politician where telling 'lies' was an occupational hazard), then again you would just be using the underlying meme to give your story a starting point, and be using virtually none of the actual creativity which Disney added to the original story. My frankenstien just has green skin and a stitching across his froehead(not like the boris karloff scar at all I belive). No flatop or portuding forehead as far as I can see, and no bolts. I dont think he looks remolty like the universeal version otherwise, besides which, my one talks cohertently as opposed to being a hulking monster. I'd say it has a humour side. I would like to include alot of jokes aswell as serious stuff here and then like any good graphic novel. I thought mayby my frankenstein could be something of a scientist whos inventions often blow up. Sounds like that could fall under parody. Its not a retelling of frankenstien, dracula or any monster book or movie. Its an alternate universe in modern day. Like as ya said, Addams family and things like it. At least I know now so I know what to avoid in that sense if its an issue, and can hopefully add more of my own things. Tho perhaps I should work on my own ideas more, my orignal stuff as opposed to books(like this monster idea). I think it would be better to get known through my own work as opposed to stuff that already been done. Tho perhaps later on in life I could do some book adaptions too. Given my frankenstien has only green skin and a head stitch, do you think this would possibly be safe to go ahead with? Also, as far as I know theres no copyright standard on vampires. White skin, pionted teeth or ears, thats pretty generic I gather. Same with zombies I believe.